The last part of Cruising the Archive: Queer Art and Culture in Los Angeles, 1945-1980 closed June 23, 2012. ONE Archives would like to thank everyone involved in this monumental project for their time, support and commitment. In case you missed the exhibition, we would encourage you to purchase the comprehensive exhibition catalogue published by ONE, which includes eight essays by artists and scholars, information on artworks and archival materials included in the exhibition, reprints from early queer publications from Los Angeles including ONE Magazine, an introduction by the exhibition’s co-curators, a map of historical sites referenced in the publication, and a limited edition poster that functions as a book jacket created by artist Onya Hogan-Finlay. Find out more information about the exhibition catalogue here. Please check ONE Archives’ website for information on exhibitions organized by ONE currently on view here. Image: Sister Corita Kent, E eye love, 1968. Serigraph, 22 3⁄4 x 22 3⁄4 inches. Morris Kight Collection. ONE Archives. Reception for “Let Your Body In” on April 21st! Please join us for the opening reception of Let Your Body In, an exhibition of work by contemporary queer artists alongside artworks and objects from the collections at ONE Archives. Participating artists include EMR (Math Bass & Dylan Mira), Maya Bookbinder, Laurel Frank, Aimee Goguen, Kim Kelly, and Lee Relvas. Additional pieces from the archives include works by Roger Campbell, Harold L. Dittmer, G.N., Olaf Odegaard, Tomata du Plenty, John Quitman, and James Snodgrass. The exhibition explores creative approaches to activating the body and playful ways of engaging with queer histories and culture. As a follow-up to Cruising the Archive, this exhibition looks at artworks outside a strictly historical context, allowing for new interpretations for queerness to emerge between the contemporary and archival. More information on the exhibition can be found here. Make sure to RSVP on Facebook here! The ONE Archives Gallery & Museum is located at 626 North Robertson Boulevard, West Hollywood, CA 90069. Enter the gallery on El Tovar Place. Parking is free for the first hour before 6pm at a parking garage located at the end of El Tovar Place. Gallery hours are Friday, 4:30 – 8:30pm, and Saturday & Sunday, 1:00 – 5:00pm. 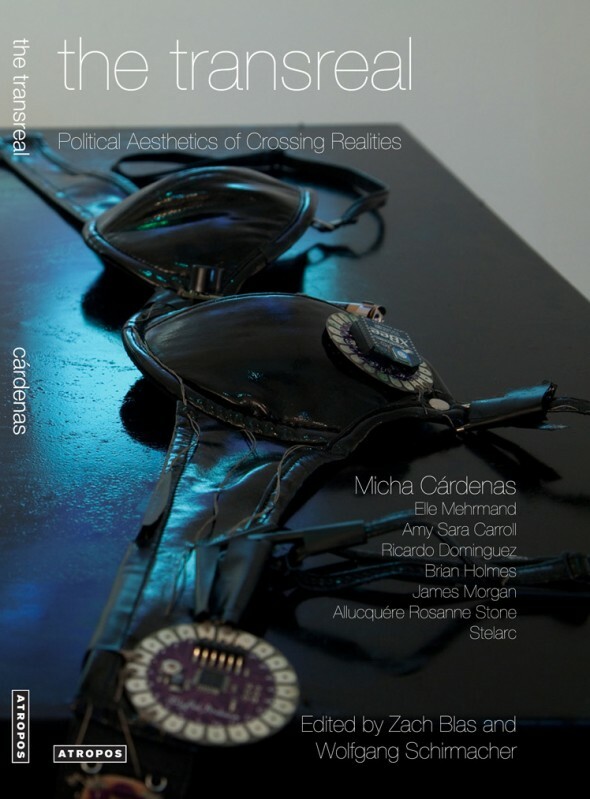 ONE Archives is pleased to host a celebration for the release of The Transreal: Political Aesthetics of Crossing Realities by Micha Cárdenas. The evening will feature an introduction by Jack Halberstam, followed by a reading from the book by Cárdenas. Wine and light refreshments will be served outside in the garden area. Please come and support this great publication! The Transreal: Political Aesthetics of Crossing Realities explores the use of multiple simultaneous realities as a medium in contemporary art, including mixed reality, augmented reality and alternate reality approaches. Building on the notion of “trans” from transgender, signifying the crossing of boundaries, the book proposes that transreal aesthetics cross the boundaries created by a proliferation of conceptions of reality that occurred as a result of postmodern theory and emerging technologies. Proposing three operations for dealing with multiple realities, The Transreal discusses artists and art collectives including Blast Theory, mez breeze, Reza Negarestani, Ricardo Dominguez and Zach Blas. Through these artists’ work and Cárdenas’ own artwork, including Becoming Dragon and collaborations with Elle Mehrmand Becoming Transreal, technésexual and virus.circus, The Transreal demonstrates that transreal aesthetics have broad implications across new media, performance art and electronic literature. The book spans a wide range of genres including theoretical analyses of artworks, poetry, source code, photos of performances and wearable electronics, and discussions with leading thinkers in new media and performance art including Stelarc, Allucquére Rosanne Stone and Ricardo Dominguez. More information on The Transreal and Cárdenas’ work can be found here. For everyone who has not seen Cruising the Archive: Wink Wink at the ONE Archives Gallery & Museum in West Hollywood, this is your last weekend to see the show! Hope everyone can get out to the gallery. In a recent review of the exhibition, Sharon Mizota of the Los Angeles Times said Cruising the Archive was, “an unruly history of queer culture in Los Angeles that is inspiring in its depth and vibrancy.” Read more of Mizota’s post on the Los Angeles Times‘ Culture Monster blog here. Enter gallery on El Tovar Place. Parking is free for the first hour at a garage located at the end of El Tovar Place. And mark you calenders, the next show at the ONE’s gallery, Let Your Body In, opens Saturday, April 21, 2012 with a reception from 5-8pm. The exhibition presents works of art by contemporary queer artists alongside artworks from the archive not included in Cruising the Archive. Check back for more information on this show! In conjunction with Cruising the Archive, please join us for a discussion with acclaimed portrait artist Don Bachardy and writer Susan Morgan at the USC Doheny Memorial Library. Don Bachardy was born in Los Angeles in 1934. He studied at the Chouinard Art Institute in Los Angeles and the Slade School of Art in London. His first solo exhibition was held in October 1961 at the Redfern Gallery in London. He has since had many solo exhibitions in Los Angeles, San Francisco, Seattle, Houston and New York. Susan Morgan has written extensively about art, design, and popular culture. Morgan is the author of Joan Jonas: I Want to Live in the Country and Other Romances and editor of Piecing Together Los Angeles: An Esther McCoy Reader, a collection of writing by Esther McCoy (1904-1989), the pre-eminent voice of West Coast modernist architecture, published by East of Borneo in 2012. “To Whom It May Concern” on view through May 31st! Catherine Lord’s installation at ONE Archives, To Whom It May Concern, will remain on view through May 31, 2012. The installation presents several hundred photographs of book dedications, considerably enlarged, on the walls of the mezzanine space at ONE Archives, encircling the closed stacks of the library from which they were culled. Do not miss this work! Cruising the Archive: Rare Looks will also be on view at ONE Archives through May 31st. ONE Archives’ address and hours can be found here. In conjunction with the Pacific Standard Time Downtown/Exposition Park Regional Weekend, ONE Archives will host a curators walkthrough of Cruising the Archive: Rare Looks at ONE National Gay & Lesbian Archives from 1-2pm on Sunday, March 4th. Additionally, ONE Archives will be open from 11-5pm on Sunday, in addition to regular Saturday hours of 11-5pm. Information on the PST Downtown/Exposition Park Regional Weekend can be found here (links to PDF). Join Guest Curator David Frantz for an informal walk-through of the exhibition Cruising the Archive: Rare Looks at ONE National Gay & Lesbian Archives. Thank you to everyone who came to Transactivation last night! Check on this video on KPCC about the event featuring interviews with artists Heather Cassils and Zackary Drucker! More information here. Do not miss this amazing event! In conjunction with Cruising the Archive, artists Heather Cassils, Zackary Drucker, Wu Tsang and Chris Vargas will present a series of live performances and video projects inspired by the collections at ONE Archives. These artists explore trans content in their multidisciplinary work and are interested in a discussion about LGBTQ archives and the “Ts” and “Qs” often missing from historical records. The performance will be followed by a discussion moderated by Dean Spade, assistant professor at the Seattle University School of Law. Also come to see Catherine Lord’s To Whom It May Concern, in its last week on view at ONE Archives. 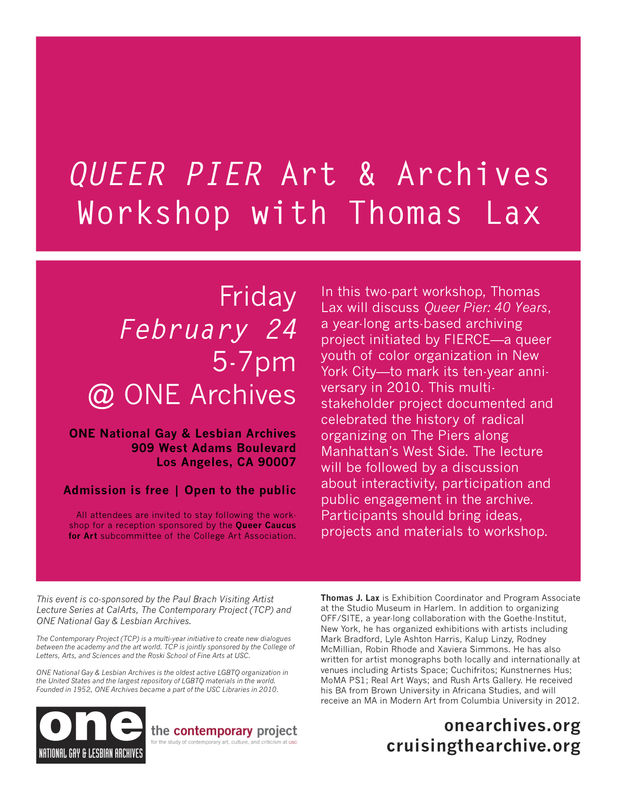 ONE Archives is excited to host the upcoming Queer Pier Art & Archives Workshop with Thomas Lax on February 24th from 5-7pm. In this two-part workshop, Thomas Lax, Exhibition Coordinator and Program Associate at the Studio Museum in Harlem, will discuss Queer Pier: 40 Years, a year-long arts-based archiving project initiated by FIERCE—a queer youth of color organization in New York City—to mark its ten-year anniversary in 2010. This multi-stakeholder project documented and celebrated the history of radical organizing on The Piers along Manhattan’s West Side. The lecture will be followed by a discussion about interactivity, participation and public engagement in the archive. Participants should bring ideas, projects and materials to workshop. The workshop is free and open to the public. Following the workshop, ONE Archives will also host a reception for the Queer Caucus for Art, in conjunction with the College Art Association 2012 Conference, from 7-9pm. All workshop participants are encouraged to stay for the reception and schmooze with an exciting group of queer artists and scholars. Workshop co-sponsored by the Paul Brach Visiting Artist Lecture Series at CalArts and The Contemporary Project (TCP). Reception presented by the Queer Caucus for Art subcommittee of the College Art Association.